Few playwrights that arrived on British stages in the last ten years have provoked more fascination or excitement than Polly Stenham. Few writers in that time seem to have written with such frankness or drawn so apparently from their own lives to make their plays. She is perhaps, a writer for a time that is both searching for an authenticity and making sense of an instinct to insist upon the validity of the individual’s voice. Or perhaps it’s just that, however instinctive, intuitive, articulate, or crafted her process might be, Polly Stenham has continued to write deeply exciting plays. Stenham made her debut, to universal acclaim, in 2007. At the age of just 20, her play That Face premiered at London’s Royal Court Theatre. It was famously described by Charles Spencer in the Daily Telegraph as “one of the most astonishing debuts in thirty years”. Polly went on to win the Evening Standard Award for most promising Playwright and TMA and Critics Circle Awards. It then transferred to the West End where it sold out and propelled Stenham to the international attention. 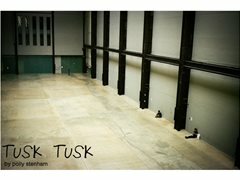 Tusk Tusk, her second play, returned to the territory of the abused children of the affluent classes – intoxicatingly dramatizing the world of a household of children abandoned by their parents. In a new flat, three children play hide-and-seek; Eliot wears a crown; little Finn, Kind of the wild things, draws on the walls; Maggie climbs them. It is a play scorched by comedy and tenderness as much as it is the heightened nightmare of a children’s fairy-tale. “(Stenham) cunningly balances gleeful home-alone sibling revelry with a growing sense of disquiet among the characters and the audience. The longer they wait for the return of their worryingly absent mother, the more pronounced the pressures and distances between them become.” from David Benedict; Variety. Stenham continually proves herself an expert at excavating the personal realms of the private and afraid. She’s celebrated for the incision of her insight into the social classes, but her work shines most in her ability to build a heightened, almost expressionistic terror in worlds which feel entirely familiar and tangible. Her work, and particularly Tusk Tusk at that, taps into the unreality of the children’s story and the nightmare. We are deeply excited to bring her urgent and incisive writing to Melbourne’s stage. Maggie is quick witted and fierce. The middle sibling, and only girl between her two brothers - she has learnt to hold her own in conflict. She is her Mother’s confidant and holds secrets no child should have to bare. Boyish by nature, she is constantly trying to keep up with her older brother, Elliot - whom she adores. However, Maggie’s mind can get the better of her when intelligence and imagination fuel her anxiety. Finn is the youngest of the three siblings. Toddler like, his mind lives in a world of make believe and fantasy. He’s funny, adorable, cheeky and an excellent little dancer. Too young to understand the full impact of what’s happening around him, his siblings have done everything in their power to shelter him from the truth about the horrors of the adult world, however Finn is smarter than they give him credit for. Cassie is the outsider. When she meets Elliot, she has no idea what she’s being dragged into. It starts out as all very exciting; she’s attracted to Elliot’s spontaneous spirit but when she stumbles through his front door in the early hours of the morning, it dawns on her pretty quickly that Elliot’s in a far more sinister situation than she ever could have predicted. She is street wise and mature beyond her years. Rowland is trying to do the right thing…and failing. He is reserved, and unemotional. An upper-class man of wealth, he doesn’t like it when things get messy. Having cheated on his wife Katie, with the siblings Mother he is guilt ridden and finds himself lying all the time. When he and Katie visit the siblings at their home he goes head to head with Elliot and his world begins to completely unravel. Katie is well intentioned but oblivious to the darker things that may be going on around her; she is clueless about her husband's affair, she has no idea how bad things have got for the children and when that becomes apparent she tries her best to offer her support, but it isn’t always what’s needed. Katie is wrapped up her own world, and when she is confronted with catastrophe she falls apart.